Easy access to firearms by people in crisis can lead to tragedies. Forms and information now available on Oregon’s Judicial Department’s Extreme Risk Protection Order website. An application packet and instructions on how to obtain, renew, challenge, and terminate Extreme Risk Protection Orders are now available. As of January 1, 2018, Oregon families finally have the right to protect their loved ones and themselves when a family member is in crisis. Extreme Risk Protection Order (ERPO) is a bipartisan act by Oregon state legislators to reduce Oregon’s high rate of firearm-suicide and the horrifying domestic violence in Oregon. In July 2017, the Oregon legislature passed SB 719, Extreme Risk Protection Order (ERPO). ERPOs allow families and law enforcement to prevent tragedies by asking a court to temporarily suspend a person’s access to firearms. This action can only be taken if there is documented evidence that a person is threatening harm to self or others. The law ensures all parties receive due process. Learn the warning signs of suicide or other violence. Share our ERPO Fact Sheet (below) with your family and friends. Use a firearm storage facility to keep firearms away from family members when they are in crisis. Share this message with your friends. Oregon families have a right to protect their loved ones when help is needed. What is an ERPO? Extreme Risk Protection Orders allow families and law enforcement to prevent tragedy by petitioning a court to temporarily suspend a person’s access to firearms if there is documented evidence that an individual is threatening harm to self or others. The person subject to that order must temporarily surrender their guns to police and will not be able to buy, sell, or possess other firearms temporarily. EPRO is a policy tool developed by the Consortium for Risk-Based Firearm Policy in 2013. California enacted a similar law after the deadly shootings on the University of California, Santa Barbara campus in 2014. Often people who are thinking of killing themselves or harming others show warning signs. Oregon law now permits families and law enforcement to take action before it’s too late. In Oregon, where suicide is 83% of all gunshot deaths, temporarily removing access to guns is especially important to prevent suicide. Is this a gun confiscation law? NO. Gun lobbyists, far-right politicians, even some media outlets have incorrectly called this firearm safety law a “confiscation” law. These hysterical myths only serve to confuse the public and endanger families by spreading incorrect information. A person under an ERPO may transfer his/her firearms to a family member who, under the Oregon Firearm Safety Act (SB 941), may legally possess firearms, without a background check. If transferring the firearms to someone who is not a family member according to OFSA, a background check is required. The person may also give the firearms to the local law enforcement agency listed in the ERPO. The person may transfer the firearms to a federally licensed firearms dealer for sale or storage. Are the respondent’s rights protected? Yes. In addition, Section 2(5)(a) of SB 719 states that the burden of proof is on the petitioner, not the respondent. That means that the person who wants the ERPO must prove to a court that an ERPO is needed. The bill can be read here. Do people show warning signs before committing suicide or a mass shooting? Yes. Eighty percent of people considering suicide give signs of their intentions and 38 of the 62 mass shooters in the last 20 years were reported as displaying signs of dangerous mental health problems prior to the killings. In many of these shootings, people who knew the shooter observed these signs, but federal and state laws provided no clear legal process to restrict his or her access to guns, even temporarily. Family members of the shooters in two Seattle mass shooting, Café Racer and Jewish Federation, have spoken out about their anguish for the lack of tools for family members who see signs that their loved ones might do terrible harm. The Isla Vista shooter’s parents were so concerned about their son’s behavior before the shootings that they contacted his therapist, who alerted police. Although law enforcement interviewed him, the officers did not remove the shooter’s guns. That shooting led to California’s Gun Violence Restraining Order, AB 1014. Which states have similar laws? California passed a similar bill called a Gun Violence Restraining Order (GVRO) in 2014 after the Isla Vista mass shooting. Washington state voters passed Initiative 1491 in November 2016 by a 40 point margin (70% to 30%). Indiana and Connecticut also have versions of ERPO. Does an ERPO violate an individual’s Second Amendment rights? No. ERPO is a tool to empower families and law enforcement that is permissible under the Second Amendment. Lack of ERPO has hurt Oregonians for decades. In 1995, in Scotts Mills, Oregon, Laura Whitson and her three children, Sarah, 6; Rachael, 3; and April, 6 months, were shot to death by David Whitson, Laura’s husband and the children’s father. David Whitson also injured Laura’s mother, Margaret Magee, who was holding April when the baby was shot to death. A Seattle lawyer who represented Mr. Whitson in divorce proceedings a year before the murders said, “I just was not shocked that the call came about him at all,” adding, “There was a potential for danger – for explosion.” An ERPO might have saved the lives of Laura Whitson and her three beautiful girls. Families know first. ERPOs save lives. 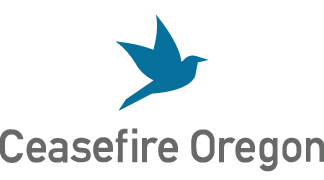 Your support enables Ceasefire Oregon to continue working toward a stronger, safer Oregon for all of us. Donations can be made to our educational foundation, our advocacy branch or our political action fund.